The problem is, we tend to ignore the stack we are working on as much as we can. Well, it’s time that we as application developers broadened our horizons a bit, expanding our understanding of the stack we work on with the introduction of Cloud, Platform As A Service (PaaS) and containers to our toolboxes. From the application developer standpoint in this article, the basic definition that covers our interoperability needs can be found on the Open Group organization. It states that interoperability is,“…the ability to share information and services” across our Cloud stack. As an application developer, we have consistently looked at our stacks with great scepticism: firstly at the stack we had to set up and maintain on our local machines, later at our Cloud stacks that are forced upon us by our work environments. It is always the barrier that has delayed us getting our applications developed and delivered in a timely manner. Well, at least that was the response we would give if we honestly answered any questions around what we thought of our stacks. The thing is, these stack tended to change over time as new components, layers and products are added or removed. Often these new stack components are not open technologies like those we have in the Red Hat portfolio: meaning they require us to adapt our way of working to accommodate their lack of open interoperability. They eat up our time as we have to both integrate them into our stacks, and find ways to standardise our application development teams ability to engage with these new components. The strength of having an Open Source based stack, either local to your machine or out in the Clouds, is that you have a guarantee of open standards that facilitate open interoperability. This happens because the upstream projects in the community have a deep seated desire not to hide how components interact, to provide insights into the protocols being used to communicate, and foster collaboration at the grass-roots level. Thus, ensuring that everyone in the industry is on the same page when interoperating with layers of their stacks. These open interoperability aspects are in place long before the community projects are taken by Red Hat and productized for enterprise use – providing industry grade service level agreements around the components that make up your Cloud stacks. 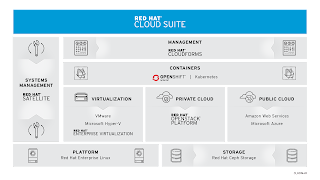 This is what the Red Hat Cloud stack brings to the table – full and open interoperability between all layers of your stack. Application developers can more easily roll with the changing stack landscape when new components are brought in, when old layers are retired, and never have to fear that proprietary communication methods will ever hamper their paths to success. Once you have the interoperability with your stacks based on Red Hat Cloud solutions, you can move on to your open solutions for application development. The JBoss middleware portfolio will provide you with all the horse power you need to integrate your application development into an open interoperable environment. Interview: How Will Immutable Infrastructure Change Our Way of Working?